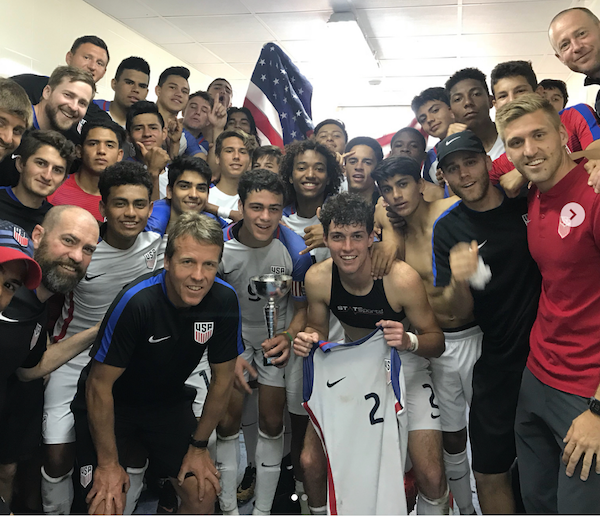 Giovanni Reyna's stoppage-time goal against Norway earned the U.S. U-17s the 2018 Sportchain Cup title in Benicassim, Spain. The NYCFC academy playmaker scored two minutes into stoppage time in the final game of a four-game competition in which Coach John Hackworth's team beat Norway twice and India twice. The Northern California native Josh Pynadath, who plays for Ajax Amsterdam's Academy, scored both gamewinners in each of the USA's 1-0 wins over India. Both of his goals were set up by Diego Lopez of Atlanta United 2. In the USA's first win over Norway, Sporting Kansas City's homegrown signee Gianluca Busio assisted on the opening goal by Real So Cal's Adam Saldana and scored the second in a 2-0 win. USA -- Damian Las; Joseph Scally, Mason Judge, Axel Alejandre, Kobe Hernandez; Adam Saldana, Gilbert Fuentes (Peter Stroud, 94), Gianluca Busio (Beni Redzic, 82’); Andres Jasson (Luis Flores, 64’), Giovanni Reyna, Ray Serrano (Diego Lopez, 46). Norway -- Sander Tangvik (Frank Stople, 7); Mikkel Tveiten, Brage Skaret, Nicolas Pignatel Jensen, Nils Vallotto; Trygve Aarstad, Mikail Maden (Xiaolong You, 89’), Iben W. Bergenheim, Christian Bell; Herman Geelmuyden, Apipon Tongnoy. USA -- Aaron Cervantes; Peter Stroud, Michael Barragan, Tayvon Gray, John Tolkin; Cesar Garcia (Luis Flores, 49’), Jack Imperato (Ray Serrano, 76’), Beni Redzic (Andres Jasson, 76); Josh Pynadath, Diego Lopez, Adam Armour (Gilbert Fuentes, 69). Goals: Saldana (Judge, Busio) 35, Busio (Serrano) 72. USA -- Damian Las; Joseph Scally, Mason Judge, Axel Alejandre, George Bello; Luis Flores (Gilbert Fuentes, 72), Adam Saldana, Andres Jasson (Adam Armour, 72’); Gianluca Busio, Giovanni Reyna, Beni Redzic (Ray Serrano, 58). Norway -- Frank Stople; Mikkel Tveiten, Brage Skaret, Nicolas Pignatel Jensen, Nils Vallotto; Trygve Aarstad, Mikail Maden (Mikael Baisotti, 58’), Lars Kristian Moldestad, Christian Bell (Thelo Aasgaard, 66’); Herman Geelmuyden, Apipon Tongnoy. USA -- Aaron Cervantes; Michael Barragan, Tayvon Gray, Kobe Hernandez, John Tolkin; Peter Stroud, Cesar Garcia, Gilbert Fuentes (Jack Imperato, 47); Ray Serrano (Adam Armour, 36), Diego Lopez, Josh Pynadath. India -- Nirat Kumar; Shabas Amammed, Moirangthen Thoiba Singh, Harpreet Singh, Gurkirat Singh; Adarsh Rai Das, Ricky John Shabong (Lalrokima, 67), Lalchanhima Sailo, Bokoy Oram (Ridge Melvin Demello, 30’); Giuson Singh Moirangthon, Rohit Danu.